Police officers are used to finding people hiding in unusual places for unusual reasons. But one man gave law enforcement a shock in Paris earlier this week. The 30-year-old was found hiding in a neighbour's cupboard while a lion cub sat on a nearby bed. Police found another lion cub in a flat in the city last year and, earlier this month, a jogger in the Netherlands came across one abandoned in a cage in a field. So what is going on? The BBC asked experts in the wildlife trade about these finds. Where do the cubs come from? Lion cubs being kept illegally in Europe are unlikely to have been born in the wild, officials say. "There is a good chance they were born in captivity in Europe," says Lois Lelanchon, an expert in the illegal wildlife trade from the International Fund for Animal Welfare. "They could be from private owners, irresponsible breeders, non-accredited zoos, and unscrupulous circuses," he says. Mr Lelanchon explains that it would be very risky to try and smuggle in an exotic animal from Africa or Asia because the trade is well-regulated and customs officers are well-trained. But it is not impossible, and some people have attempted to sneak through airport security with a big cat in the past. Richard Thomas, from the wildlife trade monitoring network Traffic, agrees that the recently discovered lions are "almost certainly captive-bred" but does not completely rule out that they may have been smuggled in from abroad. "It's a question of evading detection and seizure by whatever means the smuggler can," he says. "Whether it's simply the animal being overlooked or a case of an official being encouraged to turn a blind eye." People with a fair amount of disposable income. The suspect in Paris this week reportedly tried to sell the animal for €10,000 ($11,470; £8,835) on social media. "It's likely to be someone who thinks owning one gives them a sense of power and invincibility," says Dr Thomas. "Some owners are either rich and powerful and consider themselves above the law or are senior figures in the criminal underworld," he adds. This appeared to be the case when, in 2009, Italian police seized a crocodile they said belonged to a suspected mafia boss. Dr Thomas suggests the film industry could play a part in the glamorisation of exotic animals. "Think Al Pacino with his pet tiger in Scarface or the bad guy in the film Skyfall with his Komodo dragon," he says. But Mr Lelanchon says straightforward ignorance is another reason why people buy big cat cubs. 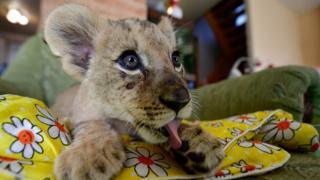 "People who think lion cubs are very pretty, exotic, cool, and different [buy them]," he says. "But they don't take into account the animal welfare and safety considerations that owning a lion entails." Well they are dangerous wild animals, for a start. "Unlike dogs, such animals haven't been tamed by centuries of domestic breeding," says Dr Thomas. "It's very unlikely they'll grow up to be tame, even if raised by humans from an early age." "Wild animals remain wild and they can be dangerous," says Mr Lelanchon. "They can put their owners and other people around them in danger, especially if they escape." And they can escape. In 2011, police in the US state of Ohio shot and killed a number of bears, wolves, tigers and lions after they were released from their enclosures at a private zoo. Another factor to consider is the wellbeing and complex needs of a big cat. "Most private owners cannot provide the right welfare for these animals," says Mr Lelanchon. "Lions don't eat dog food, obviously, and they need a lot of land to exercise." "It's not a very happy ending for most of them," he adds. What happens when they are found? Owners are likely to dispose of a big cat when it grows and becomes unmanageable, says Dr Thomas. He points to the recent example in the Netherlands and says this is probably what happened there. Alternatively, the animal may be voluntarily surrendered to the authorities but Mr Lelanchon says this is less common because the owner will almost certainly face criminal charges. If the police do find a cub then the main priority is to check its wellbeing. "When it is confiscated it is given a health check by a vet to assess the state of the animal and to look for potential evidence of cruelty," Mr Lelanchon says. "If it's in good shape, then the next step is to look for a placement facility," he explains. "That could be a wildlife centre, a zoo, or a sanctuary." If a suitable facility is found then the animal can then be rehomed. This is what happened to the emaciated lion cub that was found in an empty flat in Paris last year. It was rehomed in an animal reserve in South Africa by wildlife officials. So, in that instance at least, there was a happy ending to the story.